This is beetroot soup is one of my favourite soups. 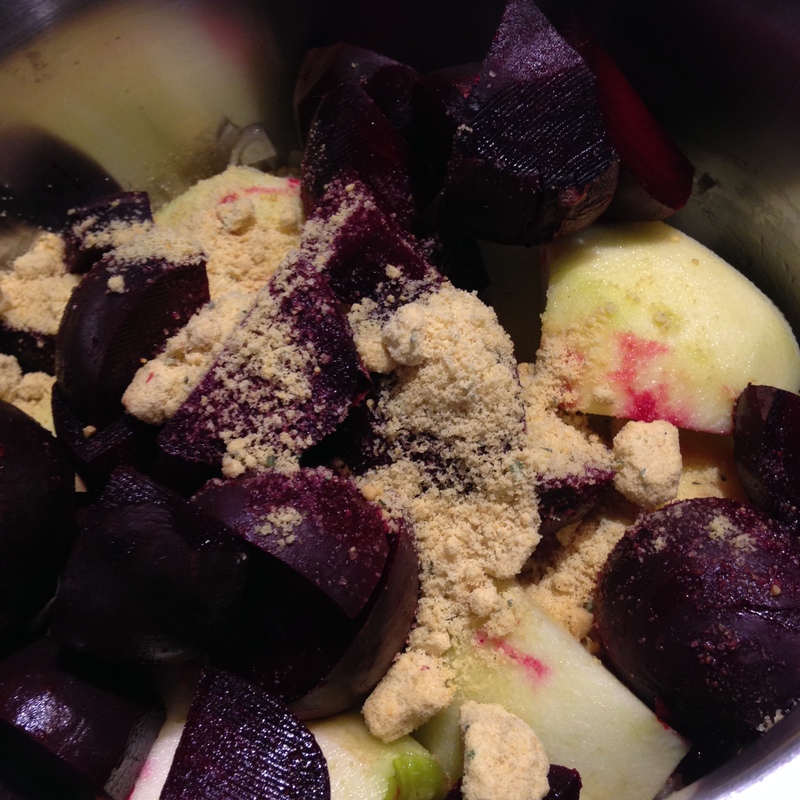 Like many yummy beetroot meals it can get messy, but the taste makes the mess worth while! I love the earthy taste of beetroot and it works so well as a hearty soup! The key ingredients in your bowl are the beetroot, tart bramley apple to counter the earthiness and fresh horseradish to pump in some delightful heat and clear your sinuses these cold winter days! Preheat your oven to 180° C (fan). Remove the leaves from your beetroot, fill a baking dish with a couple of centimetres of water and add your whole beetroots (don't top and tail them as they will bleed out into the water). Pop into the oven for an hour. When you remove your beetroot skin them as soon as you can handle them and chop into big chunks. Into a HUGE heavy based pan add the olive oil and onions. Allow the onions to cook on a medium flame with the lid on, until they begin to go translucent. While they are cooking prep your brambly apples by peeling, coring & quartering them. soup is about to get soupy! Stir the following to the pan the apple quarters, beetroot, swiss bullion, water. Pop the lid back on and allow the pan to simmer for about 25 minutes. Using a ladle transfer the soup into your liquidiser. Blitz. Grate a nice load of fresh horseradish. Ladle your soup into your bowls of choice and add a load of fresh horseradish on top. I love fresh horseradish so pile it on - you may prefer only a sprinkling as it is pretty strong! If you can eat dairy mix the freshly grated horseradish with a couple of tablespoons of live bio yogurt and put a generous dollop of that on/in your soup!